A Vietnam War comedy drama, Good Morning, Vietnam ignited Robin Williams' film career. His manic performance as Armed Forces DJ Adrian Cronauer showcases his genius comic talents, and director Barry Levinson surrounds him with a weighty story that satirizes war without undermining its gravity. It's 1965 and the US troop build-up in Vietnam is gaining strength. The Saigon-based Armed Forces Radio Service broadcasts bland announcements, heavily censored news and anemic music. Airman Second Class Adrian Cronauer (Williams) arrives as the new DJ, and immediately shakes the place up. He launches into high energy and hilarious monologues, plays rock 'n' roll music, makes fun of the news and the military, and threatens to ignore the censors. His supervisors Lieutenant Hauk (Bruno Kirby) and Sergeant Major Dickerson (J.T. Walsh) are horrified, but the troops quickly become fans and the new DJ achieves celebrity status. Despite the protestations of his assistant Private Eddie Garlick (Forest Whitaker), Cronauer spots local beauty Trinh (Chintara Sukapatana) and starts to romantically pursue her. He establishes a friendship with her brother Tuan (Tung Thanh Tran) and designates himself as an English language teacher to get closer to Trinh, and starts to understand the local culture and customs. But the war is getting more serious, bombings and bloodshed arrive in Saigon, and the military brass start to lose patience with Cronauer and his antics. 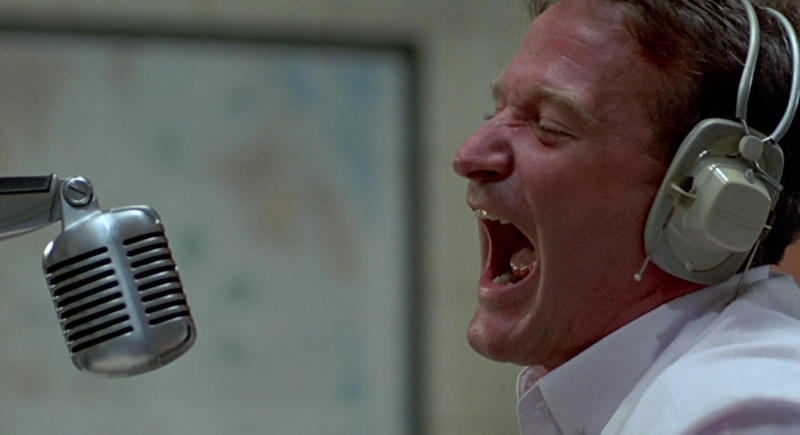 Good Morning, Vietnam is an often raucous comedy with a heavy heart. Director Barry Levinson constructs an anti-war film propelled by a counter-culture hero, but also manages to separate the soldiers from their superiors, and the politicians from the troops. The war is portrayed as both an idiotic policy and a massive troop deployment adventure, an army doing what it does in bumbling through a foreign land, while politicians blindly equate increased numbers with better odds of winning. Meanwhile there are civilians and families witnessing their land being torn apart, and its all playing out to a soundtrack of revolutionary rock. After having struggled for several years to translate his undoubted talent into an appealing big screen presence, Good Morning, Vietnam is Williams' spectacular film career launch party. Once experienced, his performance as Cronauer is impossible to forget. He is a force of nature, his mostly improvised rapid fire delivery of sarcastic and biting humour from behind the broadcast microphone is unconstrained in content and intensity. Keeping up with Williams is exhilarating and exhausting, and the film derives boundless energy from his manic intensity. But there is a lot more to the film than the central performance. The script by Mitch Markowitz, loosely inspired by the real Cronauer's experiences, mercilessly satirizes the military leadership, but in its second half is also a serious look at the US involvement in the Vietnam War. Cronauer's pursuit of Trinh, his brush with the culture, and his eventual wanderings within the labyrinths of Vietnam's jungles (he walks in circles) and Saigon's back alleys (he gets quickly disoriented) are unmistakable metaphors. Like America, Cronauer may think he has all the answers, all the swagger and all the confidence to get what he wants, but the country, the city and the people are much more complex than he imagines, and with the best of intentions he stumbles into an unintended mess. Unlike the glib tripe served up by MASH, here war is of course a target, but the violence of war always hurts, and the conflict's long term implications are on display for those who wish to probe. Williams needed straight men to withstand his barrage of humour, and the supporting cast deliver. Bruno Kirby and J.T. 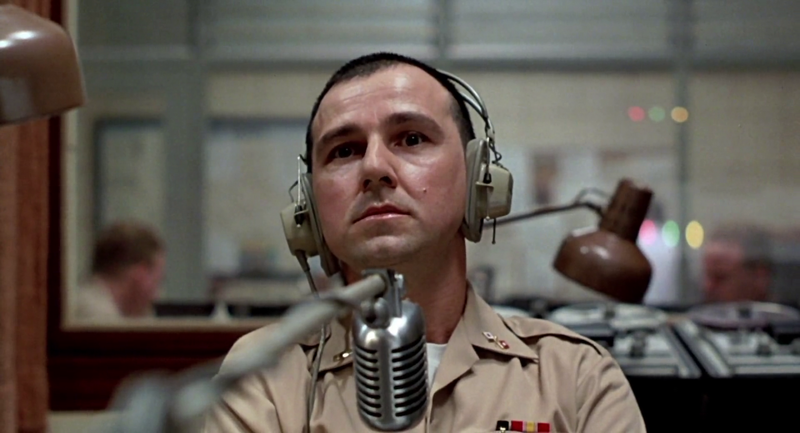 Walsh have rarely been better as Hauk and Dickerson, stiff military officers who suffer the most when Cronauer jerks their precious radio station towards pandemonium. Forest Whitaker represents the soldiers who quickly get and adopt the new DJ as one of their own, and celebrate his exuberance like a fresh breeze in the jungle heat. Good Morning, Vietnam ends with revelations, hard truths, and a soft ball game. Some lessons will be learned by individuals on the ground, but there is less hope for the detached decision makers in offices. And as always, pieces of broken language and sports culture are left strewn on the dusty streets, sometimes the only useful legacy of warfare. 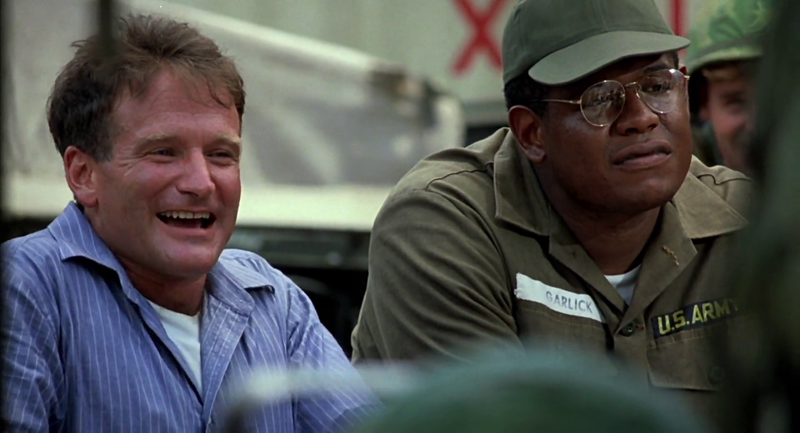 second favourite film after Hook, but as Adrian Cronauer it is my favourite performance of robin williams.